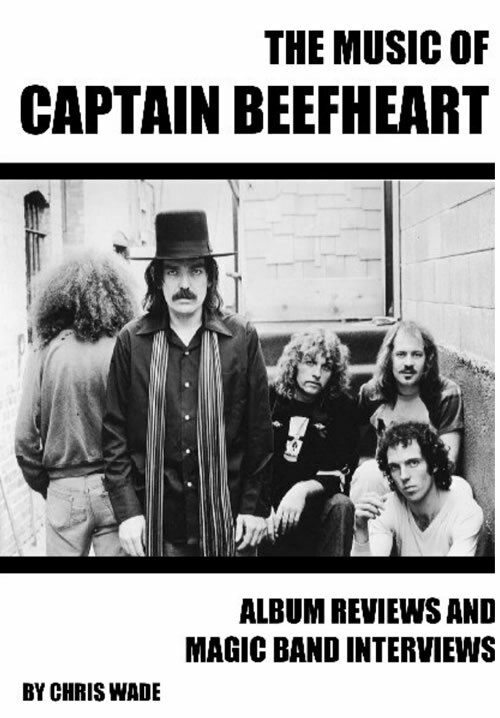 As the title so succinctly puts it this is a book of Beefheart album reviews and Magic Band interviews. A fairly slim volume at only 90 pages it keeps to the point and avoids pretentious waffling. As the author says in his introduction “I haven’t gone to write a complex dissection of every note … how one tiny lyric might sum up man’s mortality. I have listened to the albums again, and written about them as an admirer and musician …”. Chris Wade is a musician who records under the name Dodson and Fogg. In this book he concentrates on all of the main Beefheart albums from Safe As Milk to Ice Cream For Crow reviewing them in chronological order of release. Each is given three to four pages, although the Trout Mask Replica review, not surprisingly, runs to seven pages. Albums of rarities, such as Grow Fins, or compilations have not been included. However, for me there is one major omission and that is the original Bat Chain Puller. It does not have it’s own entry and is not reviewed. It does get a mention but is dismissed in the postscript as “nothing earth shatteringly new”. (Note to author: please, Chris, publish a second edition with added Bat Chain Puller ! It’s an album that musically fills the gap between Clear Spot and Shiny Beast). Overall this book is a good little introduction to the Beefheart canon. Particularly useful to someone just starting out investigating these albums and doesn’t want to get bogged down in the minutiae of the Van Vliet saga. For established fans it will be a chance to read someone else’s thoughts on the albums and reassess your own thoughts about them (maybe!). Fans will also find it worth reading for the interviews included here. Chris has made the effort to conduct new interviews with several of the Magic Band – John French, Bill Harkleroad, Art Tripp, Robert Williams and Chris Martinez – as well as a couple of people on the periphery of Don’s orbit – Dr Demento and Pauline Butcher. These interviews add an extra dimension and substance to the book. It’s well written and easily readable with the minimum of typos. Well set out with black and white images of the album covers plus a number of other images of Don and the Magic Band scattered throughout the text. There are a few factual errors though. For example it was Jeff Cotton not Don who did the vocals on Pena and The Blimp, and there isn’t a trumpet on the Shiny Beast album, that’s Bruce Fowler’s trombone. Other errors are pretty minor but, hey, I’m pernickety about things like that. It’s worth picking up a copy. The Music of Captain Beefheart can be had at a reasonable price from Wisdom Twins Books – http://wisdomtwinsbooks.weebly.com/books.html – and I believe it may also available on Kindle. As mentioned above Chris Wade is a musician, a singer-songwriter who releases his work under the name of Dodson and Fogg, variously described as psych-folk, prog-folk or acid-folk. The Radar Station asked him a few questions about his Beefheart interest. Radar Station: What’s your story of how you got into Beefheart? Chris Wade: My dad has been a Zappa fan for years and when he played me Hot Rats when I was a kid, I loved Willie the Pimp the best, mainly for the guitar solo and also that insane vocal style by the man I read was called Captain Beefheart. I was a Stranglers fan in my teens and I had an album their singer Hugh Cornwell did with Beefheart drummer Robert Williams, and I got a hold of Doc at the Radar Station after reading about it in a magazine or some place (this was before I had the internet). I loved the language and word play, that really connected with me and actually made me laugh too. When I worked at a toy shop in my late teens and early twenties, I had a friend who was a big Zappa fan, who also loved Beefheart. On my dinners I used to go to Virgin Megastore in the shopping centre where I worked and buy new CDs. One day I got Trout Mask Replica. I didn’t like it right away, but kept coming back to it and came to really admire it. I went on the get the others bit by bit. I still love the last two albums the best I think. RS: What prompted you to write this book? CW: Well I’m primarily a musician, but I love to write fiction and also non fiction. I love writing about the music I love. If there’s one thing I hate it’s reading a music book written by someone who goes on to slag every song the band ever did, i.e. a book like Revolution in the Head by Ian MacDonald. I like to read passionate books that are positive, and like to write that way too, otherwise we’re all wasting our time, reading and writing about things we don’t even like. I wanted to focus on the music and also get a portrait of Don from fresh interviews with Magic Band members and people who met him or knew him. My favourite input comes from Bill Harkleroad. That bit for me is really something special, as he rarely discusses Beefheart now, so I was honoured to even get a reply from him. RS: Do you have a favourite Beefheart album or song? CW: I’ve always loved Sue Egypt and Making Love to a Vampire with a Monkey On My Knee. I just think they’re so unique, those type of Beefheart things. They really interest me, the words and the sounds, how they don’t go together but do at the same time. I love how Beefheart’s world is so unique and contradictory. RS: Are there any Beefheart elements that have found their way into your music? CS: Musically, I could and never would replicate anyone in my own music, at least not knowingly, but I do feel the lack of conservatism has maybe rubbed off. Not caring about the reaction to your work, or if people will like it, doing it because you want to do it, putting in any sound you fancy putting in, releasing things exactly how and when you want. I admire that in artists and that’s always the way I do things. That’s why I stay independent and release everything myself. I like the control. And Beefheart definitely had that and kept it up. Those kinds of people I can really relate to. “Dodson and Fogg” are rascally lawyers in Charles Dickens’s ‘The Pickwick Papers’ – I remember a TV adaptation where the actor playing Pickwick went about snarling “Dodson and Fogg!” “Dodson and Fogg” quite a lot. What was it about their names that appealed to Chris Wade, I wonder? Hi Mike, I just love the names Dickens came up with, very English and eccentric. I think Dodson and Fogg looks better on a CD cover than plain old Chris Wade too. I love all good music But Beefheart is different, special and powerfull.